Our Quality - Pacific West America, Inc.
CNC Machining of metal and plastic is a subtractive process whereby the automated control of machining tools and mounting platforms within a CNC Machine is used to cut away particles from a block or bar, of material, to leave a shape that is compliant dimensionally with a drawing. The dimensional tolerances in the drawing determine the level of precision required. 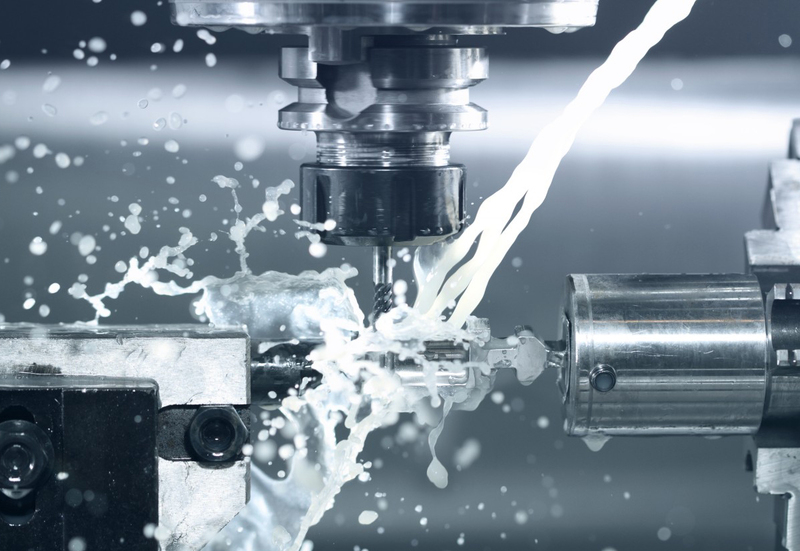 The speed at which the CNC Machine can remove material determines the cost of the machining operation, called cycle-time per part. “Precision-Made” requires a multitude of variables to be taken into consideration to achieve compliance with the drawing. 1) The speed at which the cutter can remove material and still maintain the dimensional tolerance. 2) Material hardness will determine how often the cutter needs to be sharpened and replaced, and how fast material is removed. 3) Heat generated by the cutter can put stress in the material and cause it to move out of dimensional tolerance even though the cutter had exacting precision. 4) Cutting away material can release stress that is in the remaining raw material making it move out of tolerance. Knowing the characteristics of different materials is important. 5) For extremely tight tolerances, especially on flatness call-outs over large surface areas, stress relieving techniques are applied to the materials so the final result of the machining is within tolerance. 6) Knowing the precision capabilities of your CNC Machine and programming it to run as fast as possible while maintaining the dimensional tolerances. Precision-Made machine work requires knowing all the variables mentioned above and more and then compensating for them when programming the CAM software that runs the CNC Machine. When a CNC machine part is highly complex, it is good to run First Article Samples, because the learning curve may require some adjustments in the CAM software or in the machining process. The first time a part is ever made the learning curve in the design process requires drawing changes, to make it easier to manufacture while still meeting all the important requirements dictated by the application. This ensures that mass production of the parts will not need to be scrapped. There are different types of CNC machines that do different types of cutting. For example, the CNC Mill cuts metal from a block of material mounted to a maneuverable horizontal or vertical platform. CNC Lathes & Screw Machines cut material from a spinning block or bar of material. A screw machine focuses on smaller diameter parts and higher quantities and usually has automatic bar feeders feeding in long bars of material. In many cases the diameter of a Screw Machine Part is less than 1″. These parts are called Turned Parts. When turned parts are very high-precision, very small diameter, or highly complex, they are usually made on a CNC Swiss Screw Machine. Swiss Screw Machines have very precise mechanisms for cutting very close tolerances. To achieve extremely high-precision diameters on Outer and Inner Diameters, the material will be put on a grinding machine. Sometimes a Screw Machine will cut a turned part to get it within a certain tolerance, and then the parts are put on the grinding machine to achieve a very tight dimensional tolerance. Or for OD, the entire bar of raw material will be ground to tolerance. An example of bar lengths is 3ft., 6ft. or 12ft.lengths but this can vary. Different types of secondary operations are done on the parts we machine. Such as Knurling, Bead Blasting, Anodize, Hot Black-Oxide, Nickel Plating, Electroless Nickel, Gold Plating, and Silver Plating. Some companies like to send parts out for second operations and will call asking for this service, but we only do turnkey Machining with second ops. Metal Stamping requires that tooling is manufactured and placed in a press that smashes the material in the tool, to cut and form it into shape. The material is either hand placed each time the press comes down or is fed automatically from a large roll of material with an auto feeder. Depending on the number of parts stamped at one time, and the thickness of the metal, the tonnage of the press matters. We have Presses that are up to 250 Tons with auto-feeders. Lighter Presses are 60 tons, and there is a range in between. There are small delicate metal stampings used in connectors that are placed on Circuit Boards. These are made on High-Speed Stamping Machines with auto-feeders. These machines go extremely fast with lower tonnage in the Press. We can make a wide variety of these High-Speed Stamped Parts. For simple machine parts, a PDF drawing is sufficient to quote and manufacture a part. For more complex Machine Parts, a 3D file is required. SolidWorks is the preferred format, but we do accept IGES formatted files also. If you place an order for Machine Parts we may ask if you have a copy of your 3D drawing in SolidWorks or IGES. It is helpful when making the parts and can speed the delivery. Printed Circuit Boards are fabricated in many cases out of FR-4 material and are Rigid, Single Sided, Double Sided and Multilayer up to 14 layers are made at our factory. For Rigid Circuit Boards we require a Fab Drawing, and Gerber Files. We offer Precision Metal Fabrication, Printed Circuit Boards, and Flex Circuits, Membrane Switches, and distribute RF Cable Assemblies and RF Connectors. Our expertise and knowledge in precision manufacturing, combined with high-quality equipment, and offshore as well as domestic capabilities, provides great value to any company seeking a reliable, quality oriented, vendor to help them stay on track and compete in today’s marketplace.